FASD is an umbrella term describing a range of effects that can occur in a child exposed in utero to alcohol. FASD is a major cause of learning disabilities, school failure, homelessness, and unemployment. They are disproportionately represented in the criminal justice system. Each year as many as 100,000 babies are born with FASD in the U.S. The majority of those affected show few, if any, physical signs of disability. Because some symptoms are similar, FASD is commonly misdiagnosed as ADHD, Bipolar Disorder, and Oppositional Defiant Disorder. FASD is more prevalent than autism, Down syndrome, muscular dystrophy, and spina bifida combined. Thousands of adults are living with this disorder today, including many of whom have never been diagnosed. They fall between the cracks and are unable to access services or supports of any kind. FASD is caused by a woman drinking alcohol during pregnancy. A significant amount of damage can occur during the first trimester when the frontal lobe is developing (responsible for higher brain function), even if women are unaware they are pregnant. There is no known amount of alcohol that is safe to drink while pregnant. There is no safe time to drink during pregnancy. Today, one in eight pregnant women in the US report alcohol use in the past 30 days. One in 50 have reported binge drinking in the past 30 days (five or more drinks at one time). 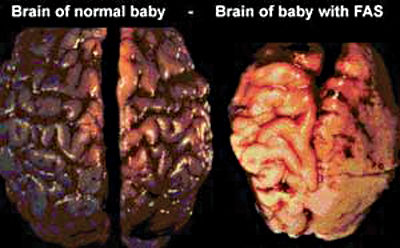 Fetal Alcohol Spectrum Disorders are 100% preventable. We have received nearly 500 submissions! Help us gather and supply more robust data! FASD Communities is an organization comprised of volunteers, each of whom has been affected by FASD in different ways. We need your help understanding which subsets of those living with FASD may have the greatest need for and may benefit the most from our efforts. If you have a loved one over the age of 18 with FASD (diagnosed or suspected) and an IQ above 70, please take a few moments to complete this survey (link above). Please complete the survey only one time. We encourage you to forward the survey to other caregivers and young adults living with the challenges of FASD.